Summary: At Penford High School, Britney Taylor is the queen bee. She dates whomever she likes, rules over her inner circle of friends like Genghis Khan, and can ruin anyone's life with a snap of perfectly manicured fingers. Just ask the unfortunate few who have crossed her. For April Bowers, Britney is also the answer to her prayers. April is so unpopular, kids don't even know she exists. But one lunch spent at Britney's table, and April is basking in the glow of popularity. But Britney's friendship comes with a high price tag. How much is April willing to pay? My Thoughts: I had no idea what to expect when I started The Lipstick Laws. It looks like a chick lit book mixed with more chick lit. We are introduced to April Bowers, the main character. April feels invisible and isn't very popular. On top of that, her best friend Hayley; really her only friend, just moved away so April is forced to deal with high school alone again. Next, we are introduced to Britney, who is the complete opposite of April. She's popular, can have anything she wants, including clothes, guys, and popularity. On the first day of school, April runs into Britney and pretends she is new to the school. April ends up hanging out with Britney quite a bit and becomes part of her clique. She is than introduced to the lipstick laws. They are basically rules, or laws that each girl in Britney's set of friends has to follow. As I read more and more about the laws, I was really turned off. I really did not like Britney!!! She was pure mean girl material! I know we were meant to feel a little bit sorry for her but I just didn't. There is a guy who is new to the school that April also takes a liking too. Of course April ends up violating one of the rules and there starts the Lipstick Lawbreakers. April finds more girls like her and they form their own sort of group and set their own goal, to take down Britney once and for all and to make her feel the way she made them all feel. Like losers! Honestly, I think most teenage girls have lived this book. It's happened to us at one point or another. We've wanted to be accepted and to feel popular. We've wanted to be in the spotlight. I really enjoyed reading The Lipstick Laws. I loved watching April's character develop and I enjoyed watching her grow a backbone and stand up for herself. At times, I did think she was a hypocrite though. I still wanted to see her happy. I also really liked the relationship with her and her crush. This book had a itsy bitsy speck bit of romance in it but not too much. 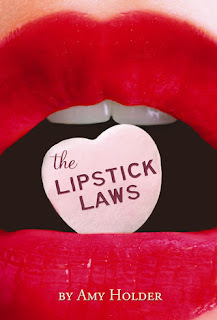 Overall: Mean girls meets chick lit in The Lipstick Laws. It was a fun book to read on a cozy night. Witty dialogue with laugh out loud moments! Cover: Really love the cover! Look at it! The lips can really grab your attention and hold it! If I saw that sitting in a store, I'd definitely grab it!